When the Ford EcoSport broke cover here in South Africa it was a complete revelation for the company. In the compact crossover space it quickly established itself as the market leader, gaining well over 50% share in the early days. As more and more competitors flooded into the market, that dominance came under pressure. But nevertheless the EcoSport remained best seller. 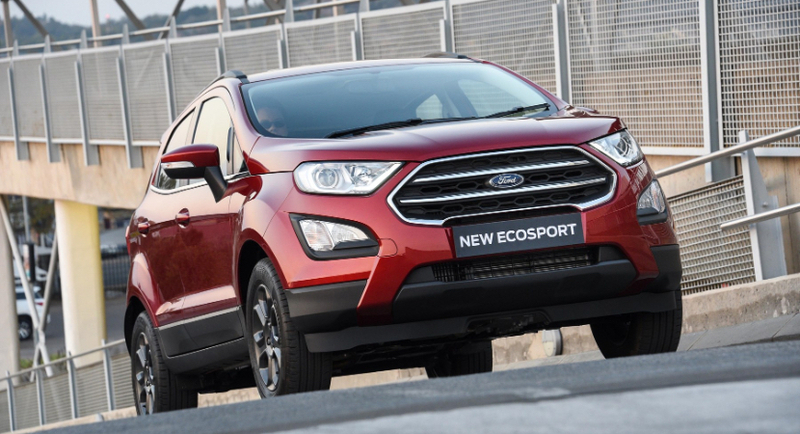 In order to keep things fresh, Ford recently introduced an all new EcoSport. This one is based on the new Fiesta’s architecture. And it’s a mighty good platform too, as we found out earlier in the year with the Fiesta itself. There are a few options in the range. Engines are the 1.0 Ecoboost turbo petrol motor or a 1.5 turbo diesel. Spec levels range from Ambiente to Trend and finally Titanium. Only the diesel, with a manual gearbox, is available in Ambiente trim, while an auto option comes in for the Trend and Titanium petrol cars. All are very frugal I must say. Having spent some time with the manual and auto petrol cars, driving over a very mixed route including some rather challenging dirt roads I can say with confidence that the EcoSport suitably fits it’s crossover nature. A good 200mm of ground clearance means you’re safe on the rough stuff and in fact it’s fairly comfortable, albeit a little stiffer in the suspension than its hatchback sister, the Fiesta. On the inside you’ll find Ford has cleaned things up nicely. There are far fewer buttons muddling the dashboard. Instead there’s a great big screen holder jutting out for the radio and other infotainment features through Ford’s Sync systems. That ranges from a 4.2 inch, to 6.5, ending in an 8 inch screen for the Titanium model. Smartphone integration with Apple Carplay and Android Auto is available. Cruise control is standard in the Titanium, while all models get rear park sensors. All in all the EcoSport is well appointed across the range. Considering the pricing outlined below, the EcoSport isn’t necessarily the cheapest car out there. But it sure does offer up a lot for the money, including a 4 year / 60,000km service plan (a year more than most competitors). It’s such a tough segment that calling a definitive winner is near impossible, but I wouldn’t be surprised if this new EcoSport maintained its dominant spot on top of the sales charts.